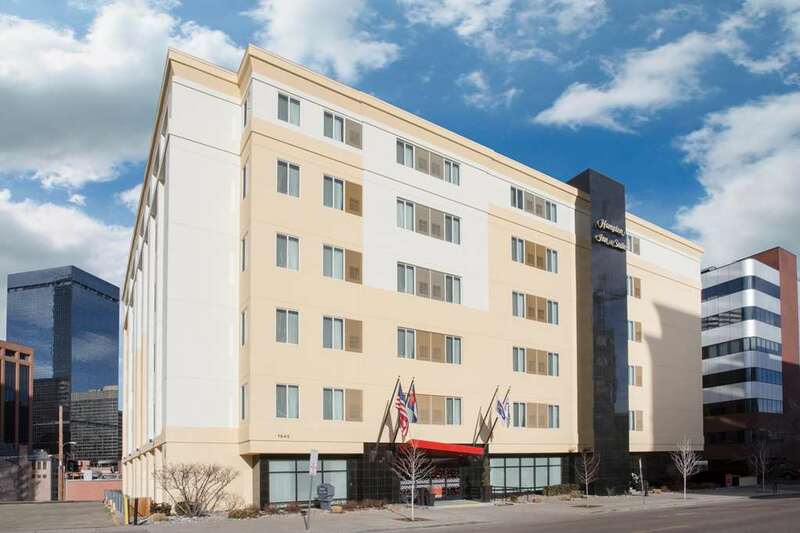 At Hampton Inn - Suites Denver-Downtown you*ll be charmed by our local flair and insight into downtown Denver. Recently renovated in 2018 our hotel is three blocks from the 16th Street Pedestrian Mall. Spend your day here or visit the Cherry Creek Mall Denver*s premier shopping center located just ten minutes away. Stand 5 280 feet above sea level at the State Capitol visit the Molly Brown House or see the Big Blue Bear at the Convention Center. Cheer on your favorite team at Coors Field Mile High or the Pepsi Center. Driving here. Browse our parking options on our website and choose what works for you. Start your day with our free hot breakfast 6am-10am. In a rush. Grab a free Hampton On the Run Breakfast Bag available Monday through Friday. Don*t forget our fresh warm cookies at 3pm and 24-hour coffee in the lobby. Relax in a newly renovated guest room offering one-king or two-queen beds. All rooms and suites feature a 52-inch HDTV with cable minibar mini-refrigerator and microwave. Whether you*re catching up on emails or streaming Netflix our free WiFi will get the job done. Hosting a meeting. We have over 4200 sq. ft. of meeting space with A/V equipment. Our dedicated Sales Team can help ensure your event is a success. Whether you*re traveling with family or on business our friendly staff will make you feel at home. Whatever brings you to Denver we*ll be there for you.